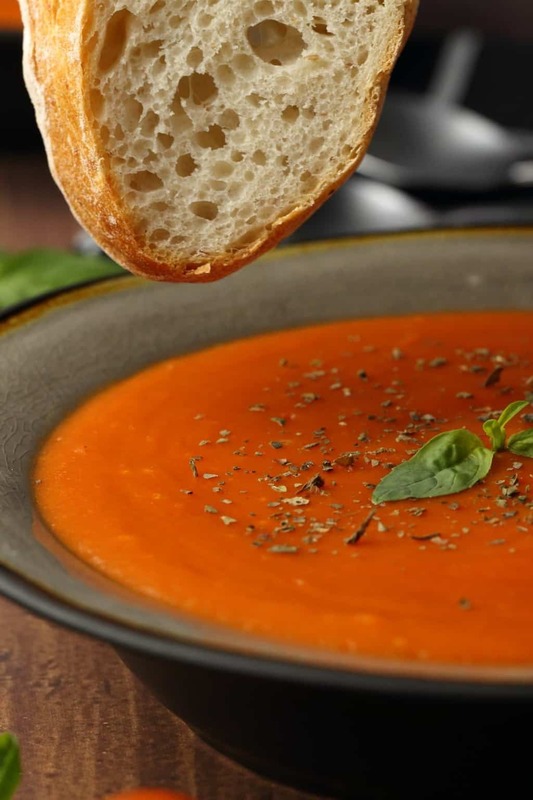 Ah tomato soup! It takes me back. To the days of making it from a packet after school. Even then it was good! 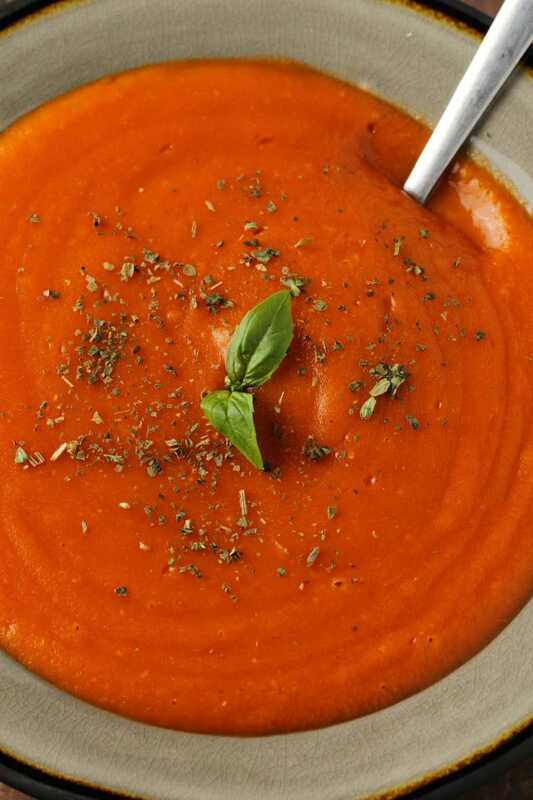 Tomato soup is one of those things that’s hard to mess up. I mean you can even make a deliciously creamy RAW version! 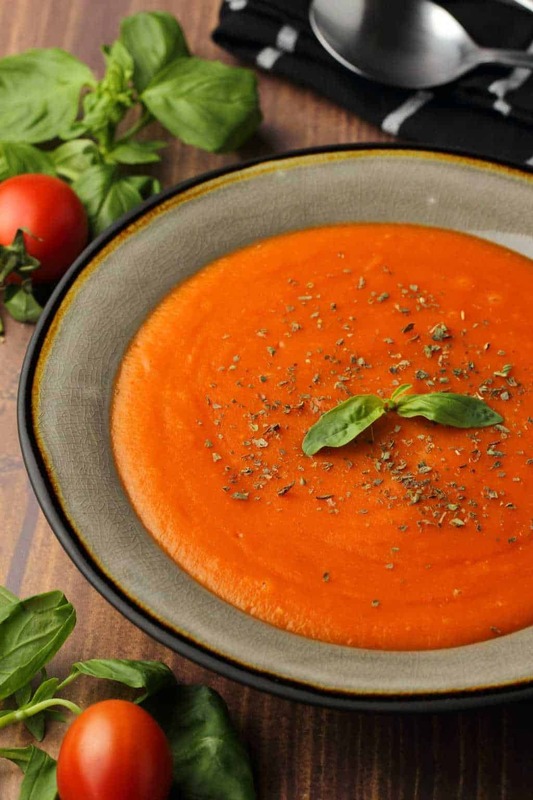 But nonetheless, I tried to make a vegan tomato soup where I used only fresh tomatoes, and it just didn’t come out well. It was SO tart it was ridiculous. When you’re cooking tomatoes, this is always a possibility. 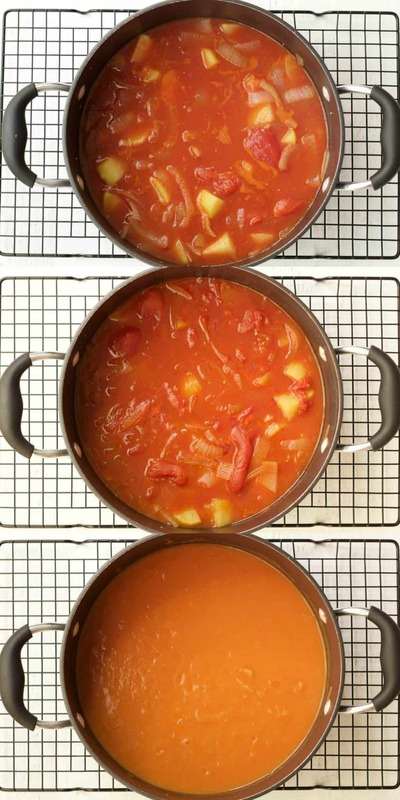 You don’t really want the skins, so using canned tomatoes where it’s all been done for you is a great idea, and you may need to add a little sugar as well to offset the tartness. So this recipe does use a little sugar, but it’s optional. If you don’t mind a bit of tartness then you can leave it out. And as for creaminess? 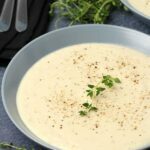 Well this soup is totally creamy, but there’s no cream in it! The creaminess comes from the potatoes, but it doesn’t taste like it’s from potatoes, if you know what I mean. 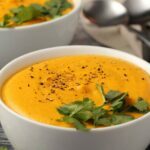 It’s got such a hearty wholesome vibe going on, and it’s wonderfully satisfying and just what you want on a cold night in, or really, whatever the weather! Add in some nice bread for dipping and life is good. It’s so easy to make this soup as you just chop everything up, sauté the onions, garlic and spices and then add everything else in at the same time, bring to the boil and then turn it down to simmer until everything is cooked. 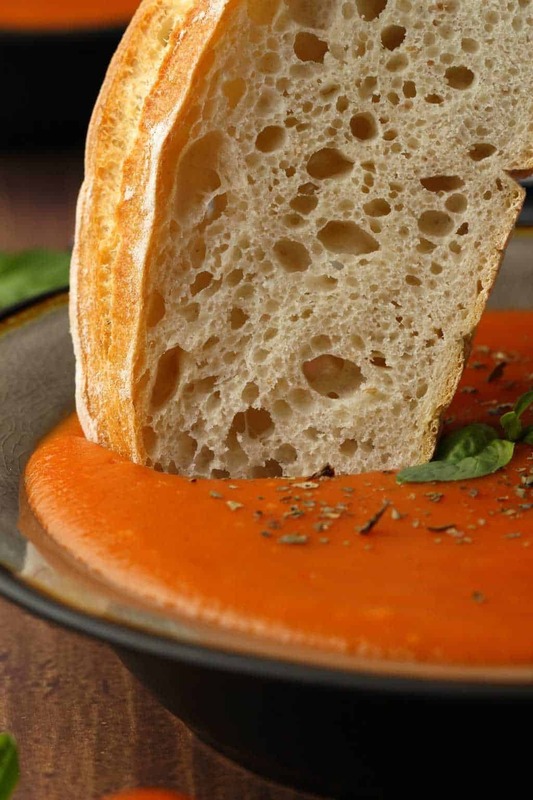 Blend it up with an immersion blender and there you have it. 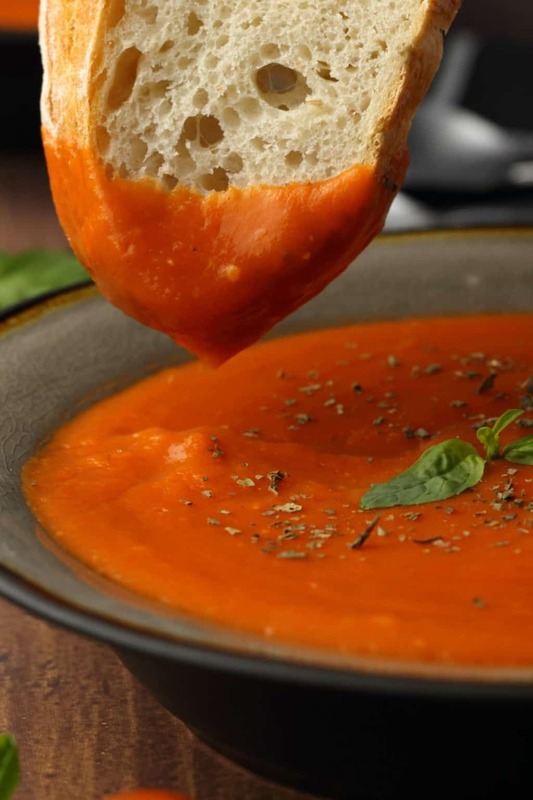 Deliciously thick creamy vegan tomato soup. It’s tangy, full of flavor and veggie-packed goodness! You’ll love how the flavors combine for a wonderfully rich taste and texture. 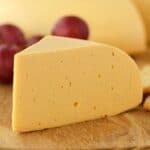 It’s also really low fat, so if you were digging into the vegan cheesecake in the afternoon and want something a little lighter in the evening, then this is a good choice! Of course it’s wonderful as an appetizer, but it totally works as an entree too. It’s more than satisfying enough to have as a main course. 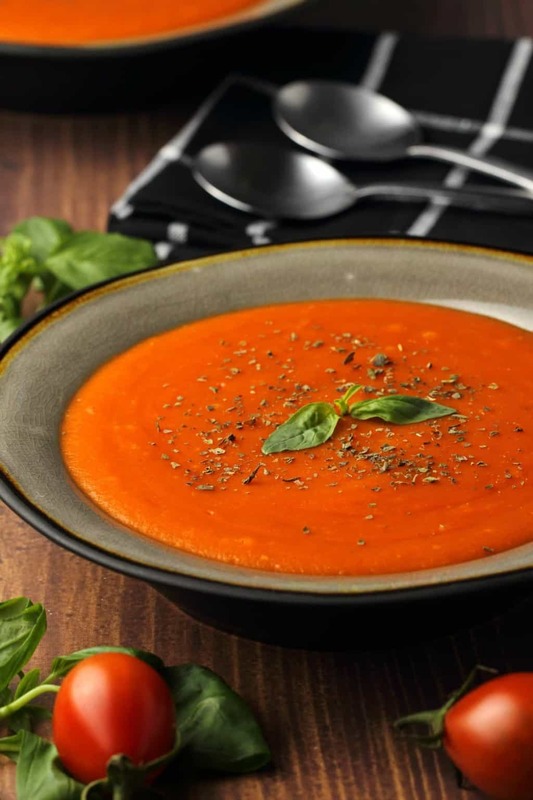 I’d love to know what you think of this vegan tomato soup, so please go ahead and leave a comment and rate this recipe too, thanks so much. 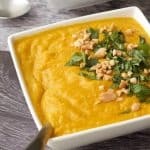 Sign up to our email list for a fabulous vegan dinner recipes ebook, containing 10 delicious recipes, and to be the first to know whenever new recipes are posted to the blog! 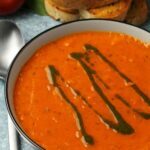 Rich and creamy vegan tomato soup. Hearty and satisfying and ideal as an appetizer, served with delicious bread for dipping. Gluten-free. 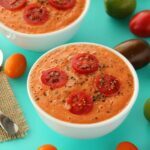 How would I make it with fresh tomatoes instead of canned, and would any particular tomato type be preferred? Hi Cassie, if you’re making it with fresh tomatoes, it would be around 10-12 tomatoes. Roma would be best. 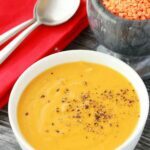 So creamy and yummy, this soup is absolutely delicious and I like that it’s so healthy too. I made this tonight for dinner. It was absolutely fabulous. I followed the recipe using brown sugar. My family highly recommends. We had vegan grilled cheese with it. Just found this recipe and decided to make it for dinner. So glad I did!! It is absolutely delicious! I will try to cook it soon. What else can you eat it with, I mean is this like a main dish or side dish? 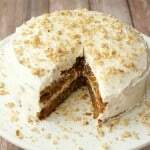 Thank you so much for share your recipe with us. This recipe had a really great base to jump off of, I thought it needed a little more of a boost so I added some smoked paprika and a splash of liquid smoke to add a bit more depth. Instead of vegetable broth I used “no-chicken bouillon” and 1.5tsp of garlic salt. 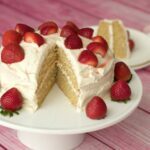 These changes added a whole different layer of flavor but the original recipe was a great starting point! Super filling, great call with the potatoes. 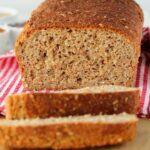 Have you thought of a way to add some more protein to this? Maybe chickpeas as well as potatoes? 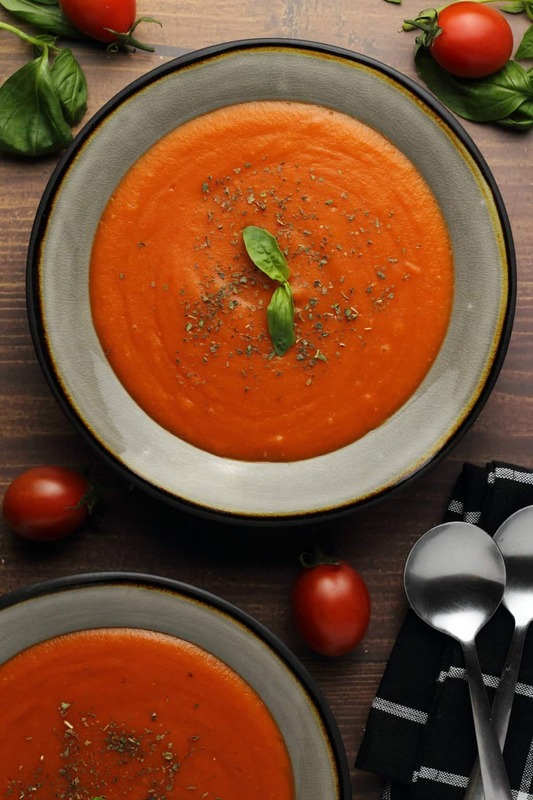 AWESOME recipe for Tomato Soup. This is a keeper for sure. I am so happy I found this soup recipe. It is delicious, and Ohhhh so easy. I have made it twice in one week. 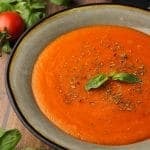 My daughter hasn’t been able to find a tomato soup she likes until I made this. She can’t get enough of it. Thank You for creating this recipe. It is Ohhhh So Delicious? And Ohhhh So Healthy. 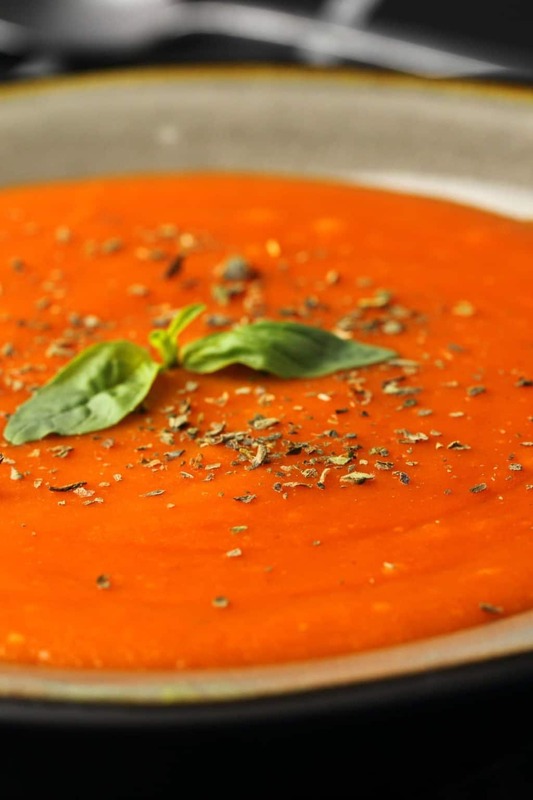 This soup could not be any simpler to make.